Chocolate addicts are going to love me for this one! 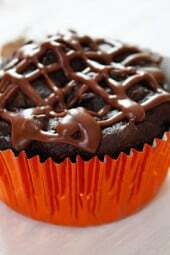 These cupcakes are super moist and delicious, and they are so easy to make. I used a box of Duncan Hines Dark Chocolate Fudge cake mix, a box of fat free instant chocolate pudding, a little water and some canned pumpkin. That’s it! No oil, no butter, no eggs. I’ve been perfecting these for weeks. My first experiments didn’t include pumpkin; they were good, but I noticed no one in my house was eating them. When I asked why, they told me they were good, perfect for people on diets…. fail!! So I was on a mission to make low fat chocolate cupcakes my family would love, and here they are! Without the chocolate pudding, these are still very good, but the pudding just gives it that extra yum factor! I used orange foil liners to give these a simple Halloween theme without too much effort. I also created some really cute Halloween cupcakes based on this base recipe. I will be posting those over the weekend. Not to create too much confusion, I am posting the chocolate glaze with this recipe, and the vanilla frosting will be posted on the next post. Both are equally yummy and a perfect solution for a low fat icing! Preheat oven to 350°. Line a cupcake tin with cupcake liners. 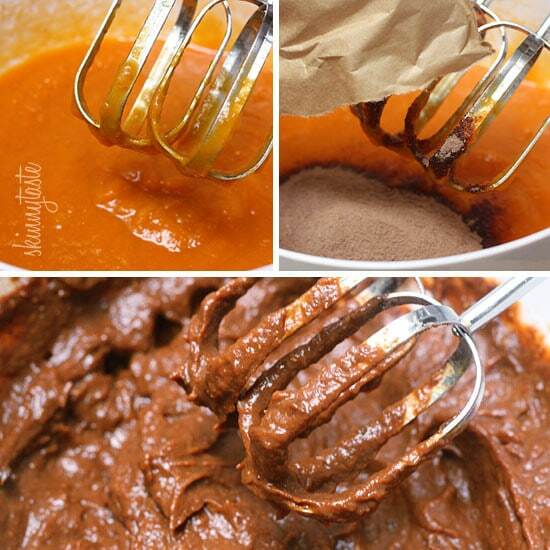 Add chocolate pudding mix and mix well. 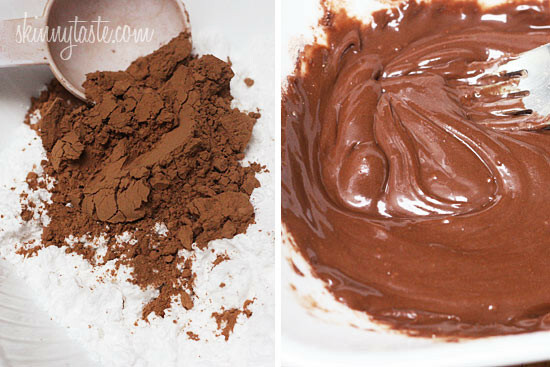 Add chocolate cake mix and beat 2 minutes. 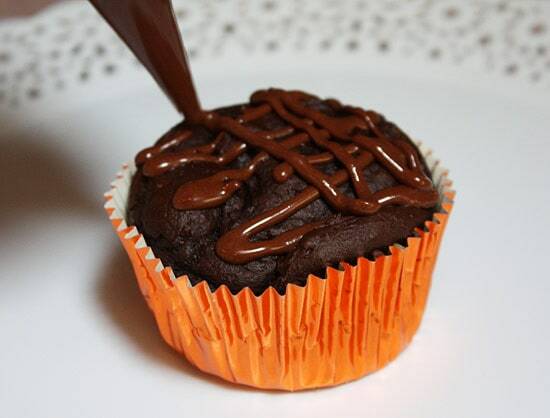 Fill cupcake liners 2/3 full and bake about 25 – 28 minutes, or until a toothpick inserted comes out clean. For the glaze: combine all dry ingredients, add vanilla and 1/2 tbsp milk, adding more 1/4 tsp at a time if needed until smooth. Add to a piping bag or use a zip lock bag and cut the corner off, drizzle onto cooled cupcakes. THANK YOU for this recipe. Made for a co-worker/fellow WWer and we both loved them.So moist! Definitely a keeper recipe. They don’t make this size cake mix any more. Can you convert it for me? These were so delicious and moist! Even my kids loved them! They are easy to make and very yummy! Amazing even with Duncan Hines only having 15.5 ounce cake mix as opposed to 18.5 ounces the recipe calls for. Also, the pudding mixes are now 1.3 instead of 1.4 ounces. Do you have any kind of recipe like this but for vanilla cupcakes? We LOVE this recipe – our favorite! But my daughter wants vanilla for her birthday and I have tried in the past – they come out very pumpkin tasting. Thank you! Gina, can you give us the SP value for the cupcake with the chocolate glaze, or include the saturated fat count so we can calculate ourselves? These look so delicious! I made these last night and the kids loved them, my oldest even said they were “the best cupcakes EVER!” They all went for seconds. That’s OK, they don’t have to know! LOL. I just found this recipe and I can’t wait to try it! It states 5 smartpoints without chocolate giaze and 3 smartpoints with glaze. Help me! Did you just mix up the point count. So it should be reversed or what? What are the measurements of other ingredients when using the Better Crocker 15.25 oz box? I was hoping to make these today since I have all of the ingredients, except I purchased the 15.25 oz box then realized it was the wrong size! I made these last night with the 15.25 oz boxes and followed the recipe with great results. I did leave the cupcakes in a few minutes longer. Worth the wait–so delicious! My friends could not believe they were ~105 calories a pop with no eggs or added oil! Thanks for this great recipe, will become my go-to when asked to bring a sweet treat to a gathering! Hi! Every time I go to the store, I only see 15.25oz boxes for the cake mix. Is there a conversion I should use to keep it consistent? Or do I need to lessen the water? When I try to follow as written, my cupcakes turn out mushy, under cooked, and not very good. 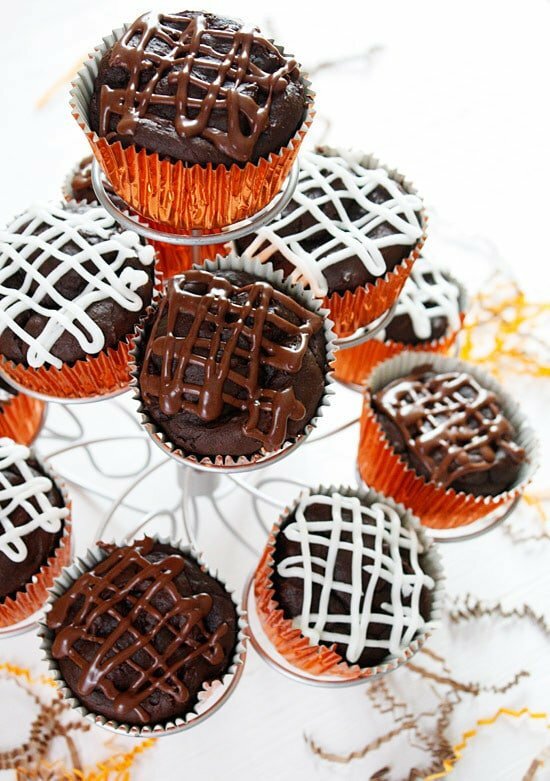 Do the cupcakes taste like pumpkin because of the canned pumpkin or do they really taste like chocolate? Is there anything to replace the pumpkin? Thanks! LOVE THEM!!! I would have never have thought to use canned pumpkin. I always use applesauce in my cake recipes. Super moist and super yummy! How do you make the white frosting/drizzle? The pudding (like Gina mentioned) is what makes them so moist! I also added mini chocolate chips to the batter! I got 21 average sized muffins. I notice you have a lot of recipes for cupcakes. However, can you also bake a 9 x 13 cake out of this recipe instead of cupcakes? I prefer to make cakes instead of cupcakes. 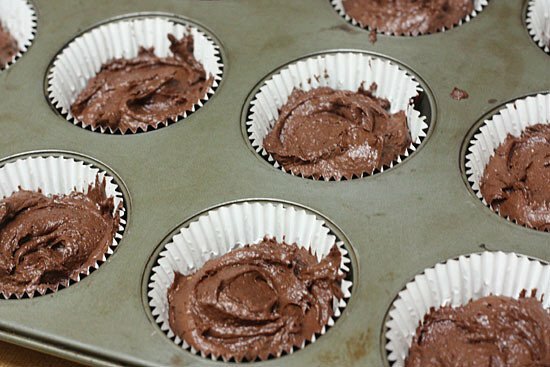 Making these right now…I licked the batter bowl…tastes so good. I added a package of Via instant Starbucks to add an extra kick. Gina you should post these again…have made them a couple of times. This was so easy and made such deliciously rich cake. Thanks Gina! These are my FAVORITE! I am going to add a bit of cinnamon to both the mix and the icing to make a low-fat texas sheet cake type cupcake. Yum yum! Just a question… how do you figure up all of the calories and carbs? I just want to be sure these are accurate before I start making them! I have been trying so hard to get back on my diet (35 lbs down, 35 lbs to go) and I don't want to mess up by making "skinny desserts" that have the wrong nutritional facts! Thanks 🙂 BTW this stuff looks UH-MAZING! Thank you so much! These are outrageous! I am not really a pumpkin fan, but I read somewhere in an earlier comment that applesauce does it too and it was delicious. I cook them for about 25 minutes and the insides are very moist but I like it that way. THANKS AGAIN! Made these tonight and they were amazing!! Easily the best chocolate cake I've ever made and I didn't even feel guilty when my 4 yr old ate 2 of them!! He hates vegies and I've found it very hard to even hide them in other foods, but you can't taste it at all in these! 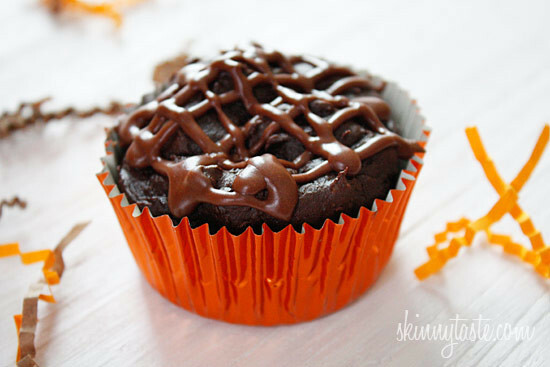 They are so moist and delicious, like a cross between a cupcake and a gooey brownie. Everyone in my house loved them 🙂 Thank you so much! has anyone ever tried to make these and sub gluten free cake mix? how did they turn out? I think I'm going to try it this weekend! I brought these to a dinner with friends…. everyone politely had one and quickly moved on to the fruit platter – NOT a big hit. I found they didn't taste nearly as chocolatey as they looked and I wasn't crazy about the texture either but my hubby likes them so I guess they'll not go to waste after all. OMG! I made these last night and shared them at our weekly Weight Watchers meeting. I used a mini muffin pan and got about 54 mini cupcakes. Worked out to about 1 point apiece. Everyone loved them! 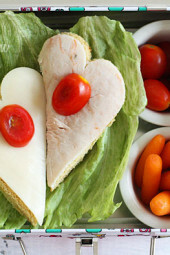 – Love ALL your recipes! These cupcakes are absolutely delicious! They are super moist and chocolatey!! No one would know there's pumpkin in them unless you told them. Love, Love, LOVE these!! These are in the oven right now.. I cut back on the pudding, water and pumpkin proportionally as the cake mix is now 16.5 oz as someone else pointed out.. but they look really dry cooking. hopefully they come out ok! It would be great to get the "official" recipe updated to reflect the new box size. Note that Dunkin Hines did not reduce the price when they reduced the size. Grrr!! I made these and they were yummy!!! Then I tried again with carrot cake mix, SF cheesecake pudding mix, and part pumpkin, part applesauce…faaaabulous!!! Does anyone know if the Duncan Hines cake box sizes have changed? I bought two 16.5oz boxes of Dark Chocolate Fudge cake mix (which the spooky spider recipe calls for), but noticed that the Super Moist Low Fat Chocolate Cupcakes call for 18.25oz. Are 2 different sizes available from DH or did they downsize to the 16.5oz only? If they downsized, will the Super Moist Low Fat Chocolate Cupcake recipe still work with the smaller size box? Thanks for your help!! just finished making these. Did use devils cake mix instead of fudge mix. They took a while longer to make (about 15 minutes longer), but they came out great. The icing was a little yellow, but that was because of the butter, but they still looked cute. Only thing that I didn't like: they crumble, a lot. Gonna spray the liners for the next batch to see if that helps with the crumbling. I followed the directions/measurements to a T and baked them for over double the baking time. i am frustrated as to why they are so doughy. All of your other recipes have turned out great for me until this one. Any suggestions? I would love to make them again(being a chocolate lover and liking low cal.). 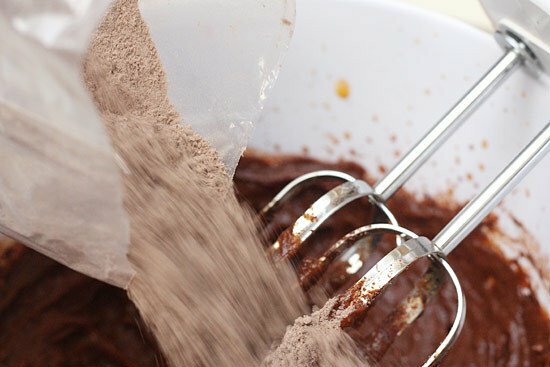 I know this is an old post, but I wonder if you used brownie mix instead of cake? I almost did that because in my store almost all of the fudge mixes were brownie. I had to really look to make sure it was indeed a fudge cake mix instead of a brownie mix. I just made these for my daughter to commemorate children's day (Brazilian holiday) tomorrow. I Fell in love with the recipe. Thank you so much for sharing all these wonderful recipes!! Since beginning WW I've had a hard time finding desserts that I can justify spending all those points on. I usually feel guilty and regret eating it. I stumbled upon your blog and its the best thing that's happened to me. lol. I made these tonight and OMG!! They taste so good. And at only 2 points a piece I don't feel guilty about eating one…or two. Other people in my house who aren't on a diet had tried them and also love them. You really don't feel like you're eating a "diet" cupcake. You are amazing!! 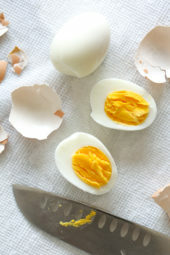 Just made these and my god, they are delicious and you can't even tell you skipped on eggs and butter! amazing! 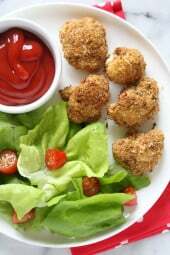 Just made these – they are delicious! Thanks, Gina, it's so nice to have a real cupcake while on WW!